Today the Sunday's Silly Sign photo is brought to you from Higashi Village in Okinawa, Japan. They are a fine bunch of people and I enjoy my visit everytime I'm in their community. 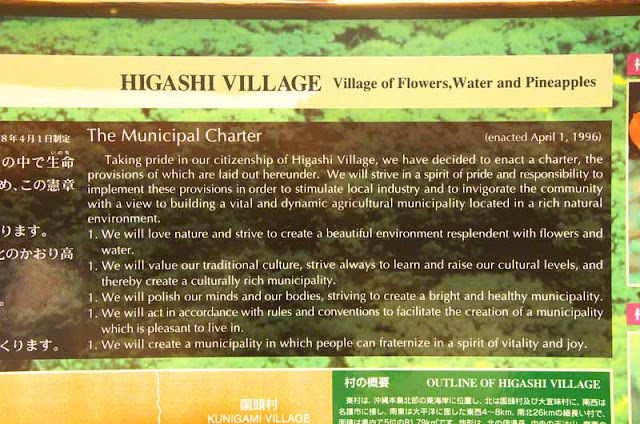 They even took the time to translate the Municipal Charter and post it at the edge of town so we could read it in the English language. If the rest of the world would follow these guidelines things would be much better for the environment, wildlife and all of humanity. We should take a close look at how they've managed to be such fine citizens. Go back and look at the photo. Carefully read each line of the charter. Memorize it if you can. It's not that difficult. The folks who founded Higashi Village and wrote this charter may have discovered the secret to the whole world living in peace and harmony. It's simple. Why hasn't anyone thought of this before ? Prioritize, that's what we need to do. Keep your priorities straight. Don't get your priorities mixed up. Write them down. Then make them all #1. There's a few thousand rioters in old London town who should read this, I admire the level of respect the people of Japan have. The world could learn a lot from those guys. For not too-unreasonable amounts of gold, I'd be the emperor over there and straighten those wiseguy rioters out for ya !